Passenger car ownership in Slovenia has almost doubled over the last 20 years and has an above-average growth rate. It is closely connected to the use of passenger cars. Since 2008, passenger car ownership in Slovenia has been growing more slowly as a result of the economic recession. Also, motorisation level (expressed in the number of cars per thousand inhabitants) in Slovenia exceeds the average rate of motorisation in the EU as well as in numerous more economically developed EU countries. 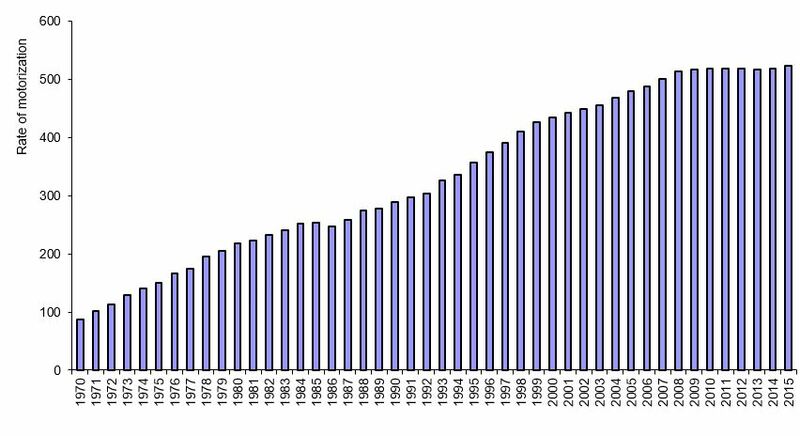 In 2015, the motorisation level in Slovenia was 523 cars per thousand inhabitants, which is approximately 50% more than in 1995. The number of passenger cars per household in Slovenia is also increasing. Compared to 1991, the number of passenger cars owned by an average Slovenian household was exceeded by one third in 2015. This indicator shows the number of passenger cars and inhabitants in the period 1970–2015 in Slovenia, the development of car ownership in the period 1970–2015 in Slovenia, the rate of motorisation in selected years (2003, 2007, 2010, 2011, 2012, 2013) in the EU-28 countries, the number of trucks per unit of GDP (truck intensity) in the period 1995–2015 in Slovenia, the number of buses per number of inhabitants in the period 1995–2015 in Slovenia and the share of diesel cars in the passenger car fleet in the period 1986–2015 in Slovenia and in 2003, 2007, 2011 and 2012 in the EU. Passenger car ownership, or the rate of motorisation, is defined as the number of passenger cars per 1,000 inhabitants (EEA, 2015). A passenger car is a road vehicle (excluding motorcycles) with fewer than nine seats (including a driver’s seat) used for transportation of passengers. The number of passenger cars is defined as the number of registered road vehicles on a certain day that can be used for transportation on public roads (SURS, 2004). The share of diesel cars in the entire passenger car fleet is defined as the number of diesel passenger cars per total number of passenger cars (EEA, 2015). Truck intensity is defined as the number of trucks per million euro of the GDP in constant 2010 prices (EEA, 2015). *Note to table PR11-6: Data for Bulgaria, Denmark, Greece, Lithuania and Slovakia are not availible. Neither Slovenia nor the EU have set any goals or target values to regulate the number of passenger cars at the national level. The goals that are indirectly linked to the motorisation rate and passenger car ownership relate to the composition rather than size of a vehicle fleet – fuel consumption and vehicle emission standards. As a rule, emission standards limit environmental pollution caused by passenger cars. Passenger car ownership is an indicator that is closely related to car use (and thus, the rate of motorisation), especially in urban areas. An increasing rate of motorisation leads to increased negative impacts on the environment. Passenger car ownership is also closely related to the trends that characterise the modern way of life, such as the decreasing number of household members, higher number of cars per household, increasing average travel distances as well as reduced accessibility and flexibility of public transport. In the EU, motorisation-related goals are linked to the composition rather than size of a vehicle fleet – fuel consumption and vehicle emission standards. Nevertheless, cars are considered a luxury in some Scandinavian countries, as basic mobility is provided by public passenger transport. Consequently, this indicator indirectly shows the transport policy orientation of a certain country or region. Countries that are successful in providing car-free mobility have considerably smaller vehicle fleets. As a rule, higher motorisation rates are a characteristic of the most economically developed countries, such as Luxembourg and Italy. Nevertheless, in some of the wealthiest European countries (especially in Scandinavia), the motorisation rate is markedly below the European average. The lowest motorisation rates are recorded in countries that are, economically, the least developed and have joined the EU most recently (e.g. Romania, Slovakia, Croatia, Hungary). In the period 2003–2013, the motorisation rate increased in all of the EU-28 countries. The largest increase was recorded in some countries that entered the EU in 2004 or 2007; this especially applies to the Baltic States, Romania and Bulgaria. Some of these countries have already surpassed the more economically developed countries. 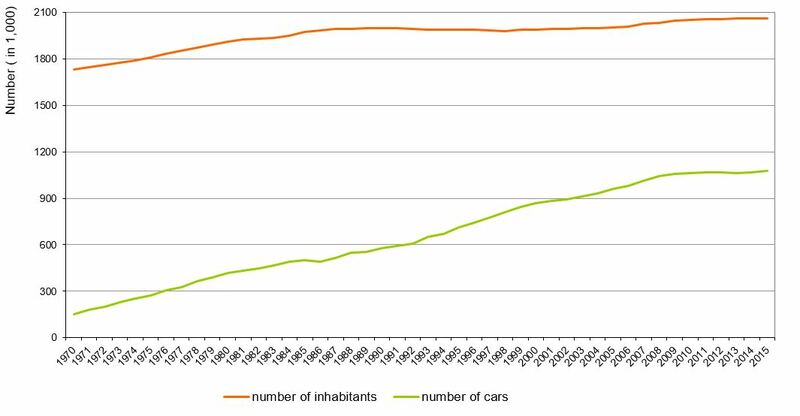 It is to be expected that rapid motorisation growth will gradually decelerate as the number of cars per inhabitant is already relatively high and other, more sustainable modes of transport, are being developed. In less developed EU countries with a lower number of cars per inhabitant, further growth in car ownership is expected, especially in some newer Member States, but also in some EU-15 Member States (EEA, 2015). Slovenia is among the countries with the highest increase in car ownership, surpassing the average of all new Member States and candidates for years except Malta and Cyprus. In 2015, there were 1,078,737 passenger cars in Slovenia, which is 7 times more than in 1970. The motorisation rate in 2015 amounted to 523 passenger cars per 1000 inhabitants, which is 166 more than in 1995. In 2010, an average Slovenian household (2.5 members) owned more than one car (1.32 in 2010, 1.34 in 2009, 1.25 in 2002, 0.94 in 1991). A slight decline in passenger car ownership compared to 2010 was recorded in 2015 (1.3 cars per average household [2.5 members]). As regards Slovenian municipalities, the highest number of passenger cars per household was recorded in the municipality of Trzin (2.65 cars per household), followed by the municipalities of Cerklje na Gorenjskem (1.93) and Gorenja vas-Poljane (1.79), while the lowest number of passenger cars per household were recorded in the municipalities of Ankaran (0.44), Osilnica (0.77) and Zavrč (0.94). The number of passenger cars per inhabitant is the highest in the municipalities of Trzin (0.96 passenger cars per inhabitant), Renče-Vogrsko (0.65) and Komen (0.64), while the lowest number of passenger cars per inhabitant was recorded in the municipalities of Ankaran (0.19), Hodoš (0.38) and Osilnica (0.41) (National Interoperability Framework Portal, 2015). The growth in the number of passenger cars also affects the number of end-of-life vehicles. These vehicles represent hazardous waste, as they contain hazardous substances. Therefore, it is very important to have an efficient system of collection and management of end-of-life vehicles established at the national level. In 2010, there were 6,807 end-of-life vehicles in Slovenia (5,305 tonnes of vehicles), while 6,598 were recorded in 2011 (5,703 tonnes) and 5,447 in 2012 (4,528 tonnes). The share of reused or recovered end-of-life vehicles increased in the period 2010–2012, amounting to 90.6% in 2010, 90.3% in 2011 and 100% in 2012. Despite its constant growth, the market of passenger cars in Slovenia has not shown any signs of saturation in recent years, as the number of registered vehicles has been growing rapidly since 2012. Growth was stalled in 2008 due to the recession, but resumed in 2012. The number of passenger cars registered for the first time in 2012 was 4,576. In 2013, the number increased to 5,062, in 2014 to 6,392 and in 2015 to 7,129 passenger cars (Statistical Office of the Republic of Slovenia, 2016a). Transport policy on the national level as well in the cities still favours the use of personal cars, which is reflected in rapidly growing investments in road infrastructure, decreasing competitiveness of public passenger transport and the changing settlement patterns in Slovenia (suburbanisation, which is based on accessibility by passenger cars). As a consequence, a growing share of the population decides to meet their transportation needs by using passenger cars. The share of diesel passenger cars in Slovenia increased consistently in the period 1986–2015. From 2002 onwards, the trend of growth became particularly distinct. The share of diesel passenger cars was 7% in 1986, slightly under 12% in 2002 and as high as 44% in 2015. A higher share of diesel vehicles contributes to better energy efficiency compared to gasoline vehicles. Diesel vehicles contribute considerably less to carbon monoxide (CO) and carbon dioxide (CO2) pollution. On the other hand, diesel vehicles contribute more to air pollution with particulates and nitrogen oxides (NOx). In all of the EU-28 countries, the share of diesel vehicles increased in the period 2003–2012. The average share of diesel vehicles in European countries is lower than in Slovenia. In 2012 it was 34% (in Slovenia it was approximately 4% higher). Compared to the average share of diesel cars in European countries in 2012, the share in Slovenia was 6% higher in 2013, 8% higher in 2014 and more than 10% higher in 2015. 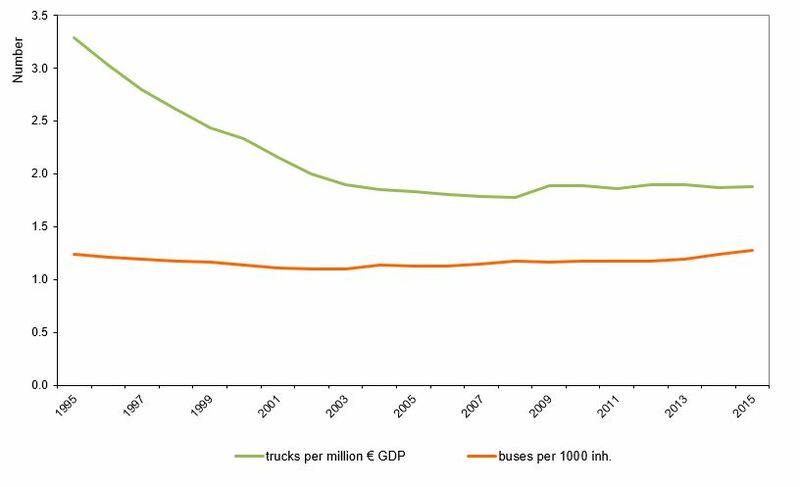 The number of buses per 1000 inhabitants was relatively constant in the period 1995–2014, at 1.2 buses per 1000 inhabitants. In 2015, it grew to 1.3 buses per 1000 inhabitants. 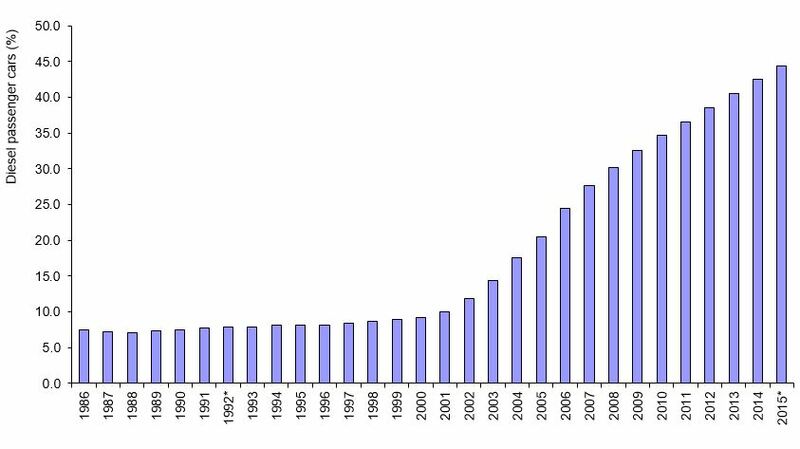 The number of trucks per million euro of the GDP in Slovenia in the period 1995–2003 dropped from 3.3 to 1.9. The reason for the drop was GDP growth, which was faster than the growth of the number of trucks. In 2003, GDP growth stabilised, which is why the number of trucks in the period 2013–2015 was relatively constant, at 1.9 trucks per million euro of the GDP.